To add flavor with the drippings off meats, use a suction tool like the one pictured here. It is faster and more efficient than using a spoon or brush. During the cooking process, especially with fowl and especially the last 15-20 minutes of cooking use the tool to suction up the juices and then to pump the drippings over your meal. It will make the meal more flavorful. When I do this I take the entire pan out of the oven, close the oven door, baste the meal thoroughly and then put it back into the hot oven. It is easier and safer to do it this way. A tool like the one pictured is inexpensive and it has a number of other uses in the kitchen, as well. You can make use of it when extracting water or another liquid or when you are making a gravy or sauce. If you need one of these, buy one that comes with a cleaning brush. This is where basting brushes work great. But you should use two of them. One to brush the raw meat or fish or poultry with the sauce. The other brush is then used to treat the meat during cooking. This is a sanitation issue. There will be no contamination problems if you use two different basting brushes. They come in all sizes and shapes. A 1 1/2 inch brush like the one pictured to the left is good for most jobs. One downside to using brushes has been that the bristles occasionally get left on whatever is being cooked. The bristles can also melt if you are not careful. The is a very popular brush. Handsome, too, with its stainless steel handle. The bristles are designed to release a deliberate, even flow of oil, butter or sauce. 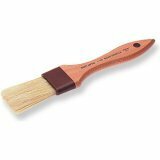 This brush can also be used as a pastry brush but remember to never use one brush for both jobs. Keep your basting brushes separate from your pastry brushes. For basting at the grill ...the brush to the left is my choice. It is silicone and its long handle is angled to keep your hands away from the heat! 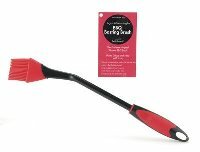 This Elizabeth Karmel Basting Brush is the first-ever long, angled handle tool! The design and length of the handle makes it easy (and safe) to reach food on the back of the grill.